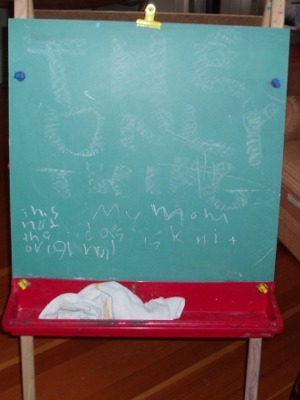 While sitting in the dining room knitting with some friends my eight year old wrote this message on his art easel. It says, "THE ONLY THING my mom does is knit." It also has the notation, "This is not the original" because he erased it while I was getting my camera and he recreated it for me.